ChromeCast, AirPlay and Google Home are baked into this vintage-styled and thoroughly solid-sounding wireless, Bluetooth and multi-room-capable speaker, but its frequent drop-outs disappoint. Reviewing the Marshall Acton means talking about how consumer electronics companies are always looking for a brands; and how most brands with any kind of recognition have already been licensed to Chinese gadget-makers (a Porsche laptop or a KFC phone anyone?). With that in mind, Zound's decision to put not just a Marshall logo on the Acton, but also the associated retro styling, makes a lot of sense. Marshall's rock-star heritage actually works very well when applied to the diminutive Acton. The use of the same mottled matte black vinyl plastic covering found on Marshall guitar amps, complete with rounded corners and beautifully machined brass knobs, means we've got a fantastic-looking device on our hands here. 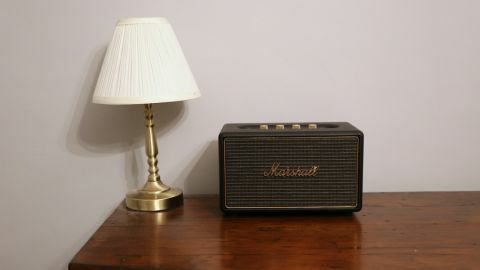 The Marshall Acton is a wireless Bluetooth speaker capable of AirPlay, ChromeCast and Spotify Connect, and it can also form part of a multi-room music network. Its size makes it best suited to a bookshelf or bedroom, but at 40W it will out-perform anything it might be replacing. Be warned though: the Marshall Acton makes up for in volume what it lacks in stature, and this can hit some serious volumes. Part of a trio of new wireless Bluetooth speakers that can be networked together using apps (there's no remote control included), the Marshall Acton – available in black or cream – sells for $349 (£319 / AU$380). The Marshall Acton certainly looks the part with its combination of brass features with black vinyl. Despite its tiny size, stylistically the Marshall Acton looks every bit the kind of Marshall speaker you might expect to find on a stage. It's small – just 265 x 160 x 150 mm – and weighs 2.8kg, but oddly there are no portability options; the Acton needs to be plugged into the mains, and there is no carry handle. Nor is there a remote control, with Marshalls' Multi-Room app (and Google Home) taking care of set-up and configuration duties. However, on its top are four brass buttons for volume, bass, treble, and for toggling between sources of audio. That includes WiFi, Bluetooth and an auxiliary 3.5 mm socket on the top of the Marshall Acton, alongside a button for moving between multi-room and single source modes. That source knob can also be pointed at seven separate presets, which can include Spotify playlists (if you're a premium subscriber). Versatility is always good, but there are perhaps too many choices when it comes to connecting to the Marshall Acton. While its Bluetooth 4.2 connectivity can be used by almost any mobile device, Apple products can connect over AirPlay whether they're using the Acton as a single speaker or networked to other speakers in Marshall's multi-room collection. It's also possible to take the Chromecast route: Chromecast functionality is baked into the Marshall Acton, and is the default way of connecting it to a home network. Users of the Spotify Connect app can also route music straight to the Acton too. Inside the Acton is some serious power; a 30W Class D amplifier for the woofer and two 10W Class D amplifiers for the tweeters. That's 40W in total, which is arguably overkill for a bedside table-style speaker. Although the free Marshall Multi-Room app can be used to set-up and operate the Marshall Acton and its peers, in practice it appears to have hived-off everything to the Google Home app. That's a new development – it wasn't that way on the Marshall Stanmore we reviewed recently. Once switched-on, firing-up Marshall's app immediately leads to the Google Home app, which instantly recognises the presence of the Acton and asks for a location name – a 'zone'. Once it's labeled 'bedroom', 'bathroom' or even 'shed', Google's app attaches to a home WiFi network and gets busy downloading the latest firmware. The completion of all of these small stages of the set-up procedure are celebrated by audible guitar riffs, in keeping with the Marshall branding. Then comes a 'casting' tutorial, though it's not all good – it prompted me to open the BBC iPlayer Radio app to stream to the Acton, but then proceeded to play the audio through my iPhone. It mostly works fine, but Marshall's approach to multi-room is all a bit manual. The use of the Google Home did prove useful during set-up, but it's otherwise a pointless additional app. While it can be used to add new devices, you'll need to open the Marshall app to make any changes to volume, bass and treble, for example. Using the app it's easy enough to swap between other Marshall speakers on the same network, and set-up presets to Spotify playlists and web radio stations via the app. During our testing the Marshall Acton swapped between being tremendously impressive to downright irritating. First, the good stuff; music is superb, with lots of depth and detail making up for the lack of much stereo separation from this small speaker. The volume goes incredibly high – pointlessly high, even – without distortion, and fans of bass with absolutely love the Acton. However, there were just too many drop-outs during our review. Not only that, but when initiating streaming the Acton often stalled; a nudge of the volume knob appeared to bring it back to life. It's hard to argue with the Marshall Acton's gorgeous styling and equally attractive sound quality, and the detail in the brass knobs and brushed gold-metallic panel gives the Acton enviable wow factor. The myriad connectivity options are also impressive, in particular the choice to play music through either the Marshall Multi-Room hub app, or from a phone through Spotify or the native music apps on Apple and Android devices. However, the highlight is surely its deep and detailed sound quality, which will especially impress anyone after bass and volume. Having previously used Marshall's own app to successfully set-up the Marshall Stanmore, having Google Home now so baked into the process seems rather pointless. So do the unnecessarily high volumes. However, what was most disappointing were the frequent signal drop-outs that left the Acton seeming unreliable. A better-sized speaker for general use than its pricier sibling the Marshall Stanmore, the great-sounding, incredibly well-connected – and very expensive – Marshall Acton is ultimately let down by its unreliability as a wireless speaker. It's a nice try, but this is arguably style over substance. We're also not completely convinced by the concept of a Marshall multi-room system; you might buy one iconic-looking Marshall speaker, but wouldn't two, three for four look a little odd in your home?